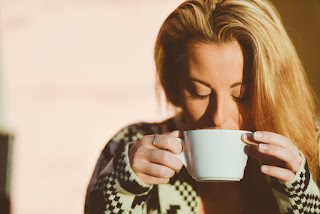 If tea is a sophisticated drink for calm and practical people, then coffee is tea’s crazy second cousin for the passionate and the caffeine-driven. Okay, so anybody can drink coffee, but let’s face it, if you’re a writer and you enjoy coffee, then there’s a 79% chance you’re enthusiastic. Or you’re just not a morning person. Take your pick. But how, might you ask, can a tea drinker like coffee just as much? On the contrary, my friend, I… I have no idea. I just do. My evolution of liking coffee is a strange story. Back when I was a kid, I used to hang out with my writing club at Starbucks where we’d buy Frappuccino’s, and for years, I wouldn’t drink anything other than sugar-slathered drinks. Then one year, my friend Sarah came to visit me in Europe, and we took a trip down to Italy where I tried my first sugar-infused cappuccino. It was marvelous. Then I started drinking cappuccinos on a regular basis, without sugar. Then I went straight for strong, black coffee. 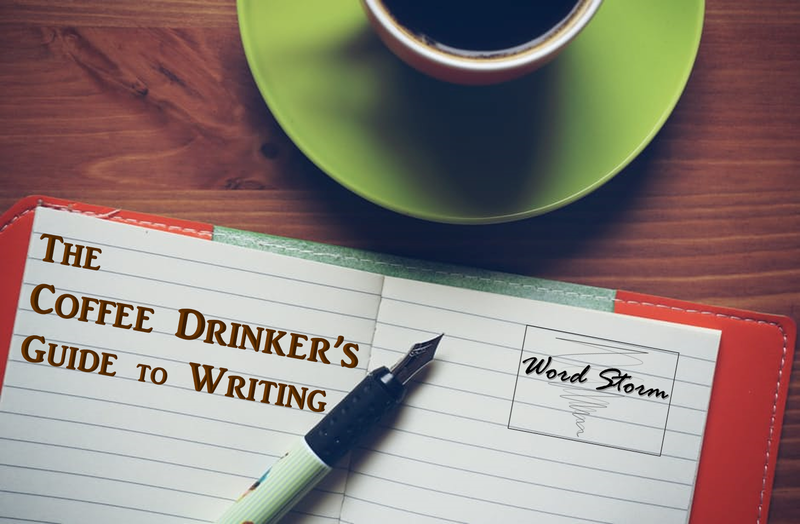 Whether you’re like me or not—if you’re a writer who likes coffee, this post is for you! Coffee comes in many, many varieties. From chocolate-covered coffee beans and espressos to cappuccinos and iced lattes, there are plenty of coffees to enjoy on the go or at a leisurely pace. Personally, I like chocolate covered coffee beans for road trips, and they’re great for those dull times when your imagination just needs a boost. Road trips can be great for reading if you’re not the driver, and they can be great for world-building or character development whoever you are! When it comes to sitting and having a writing-related discussion, I like a good cappuccino. If I need some serious motivation, I’ll switch to strong black coffee. The caffeine in coffee is a great motivator. It comes from a bean, so coffee has to be so much better for you than energy drinks. Besides, it has so many uses! Feeling groggy because it’s morning and you can’t quite wake up enough to think let alone write? Have a cup of coffee. Staying up late writing for NaNoWriMo or some other project and you need the energy? Drink coffee! Just the smell of coffee is inspirational. There’s nothing quite like the smell of freshly brewed coffee, filling the room and promising to awaken your senses. Can we get a coffee-scented candle already? Or coffee-scented perfume? Or maybe I just need to make more coffee! Coffee stains make your stories look 1000x more awesome. Besides, if you’re finished with your pristine, perfect new draft manuscript, you can douse it with coffee instead of burning it. After all, coffee smells good! But whatever you do, don’t douse it with coffee and then burn it. The smell of burnt coffee is not so inspirational. Drinking coffee is a good excuse to collect a bunch of writerly or geeky mugs. Okay, so you could do this with tea as well, but I’m not writing about tea, am I? 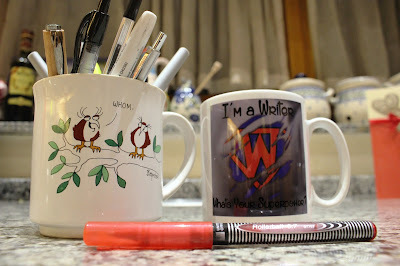 My own collection of mugs, though quite small, makes drinking coffee twice as enjoyable. Not only am I having a caffeinated drink, but I’m also getting an inspirational snippet as well. Sounds like a win-win deal to me! Coffee is just nice, plain and simple. Or complicated and sugary if you prefer. So don’t let anybody tell you not to drink it if they don’t like it. Everybody’s entitled to his or her opinion. So, drink ten cups of coffee like Lorelai Gilmore. Or sip a cappuccino like me. Or just, you know, enjoy a cup of coffee, however you like it, just like you do. Then get to writing and enjoy your craft! Liked this post? You might also enjoy: The Proper Care and Feeding of a Writer: Some of the Basics and The Tea Drinker’s Guide to Writing. Let’s chat! What’s your favorite type of coffee? What’s your favorite benefit to being a coffee drinker and a writer? Did I leave anything out? Drinking coffee while writing is SUCH an aesthetic thing for me, ahhhh. The smell is so great!